Wow. Wind and tidal currents are really important to us now. 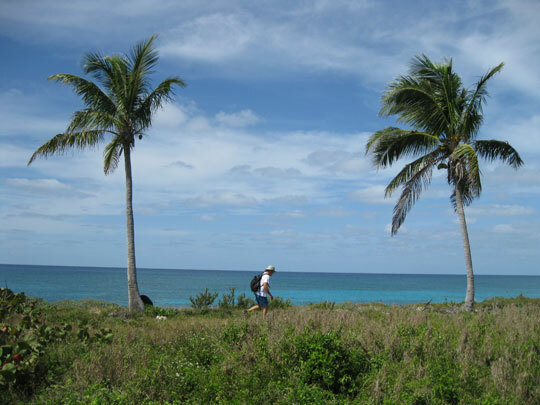 We left Saturday to explore the cays below Bimini. After a couple of very choppy nights we are learning better how to select our anchorages. Saturday we waited on the tide, leaving late afternoon and anchoring in Nixon’s Harbor again. In the daylight we picked a much better spot, but hightailed it early in the morning after being tossed around by 20 knot winds. We found a much nicer location on the east side of Cat Key. It was by a resort with a small airstrip. 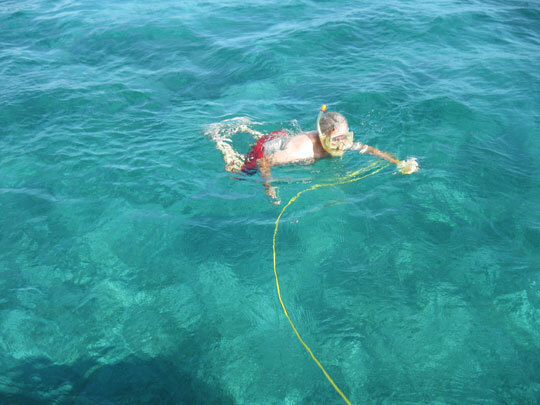 When I dove down to check on the anchor I saw a sea turtle. I tried chasing it in Duwan’s direction so she could see, but the turtle was much too smart and vanished quickly. Here we washed our clothes in a bucket and tried out the new pressure cooker. Very relaxing, but we still had something of a rolly night. With the wind changing to the east we went up to Gun Cay and anchored on the western (Atlantic) side. The anchorage and the cay were nice. On Tuesday we dinghied over and spent the day exploring uninhabited Gun Cay. 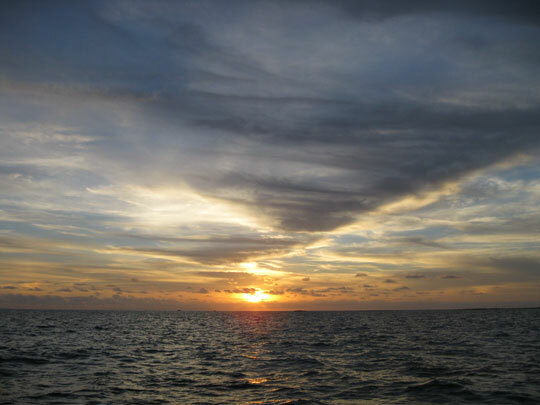 The wind shifted to SW and chased us back to our Cat Cay anchorage Wednesday night. Thursday we sailed up through the Grand Banks back to Bimini, stopping to circle the wreck of the ‘Sapona’. 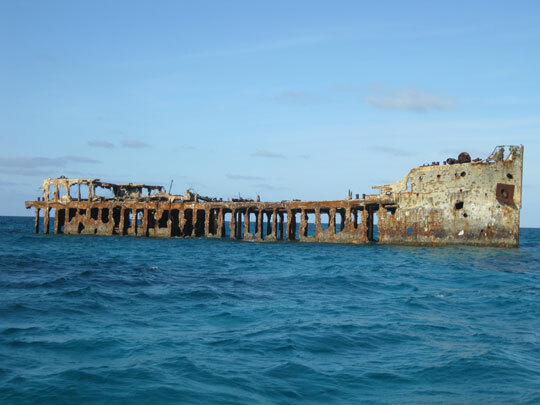 This concrete ship wrecked in 1929 and since has been a club, a haven for rum-runners during American prohibition, and a practice target for WWII bombers. The old gal looks pretty rough. Thursday night was spent in the quiet northernmost anchorage between the Bimini islands. From here we plan to anchor on the northern Atlantic side of Bimini then start the long (for us) passage east to the Berry Islands. The only really enjoyable thing about NIxon's Harbor was the sunset. Greg goes for his first swim. The water is still too cold for Duwan. 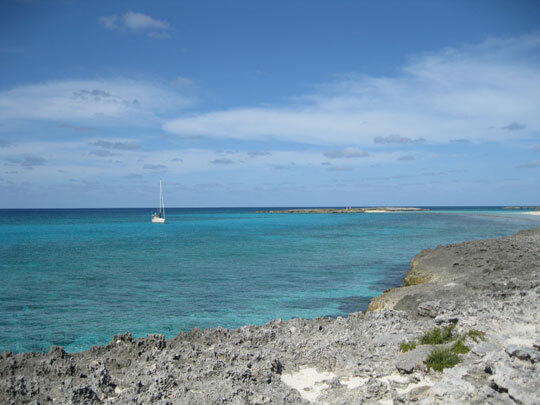 A view of Blue Wing in the Anchorage off of Gun Cay. 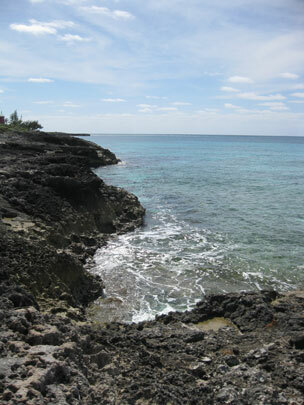 Gun Cay was very rocky and a very hard hike, but really really pretty. Duwan wanted a coconut, but there were not good ones on the ground and no one wanted to climb a palm tree. 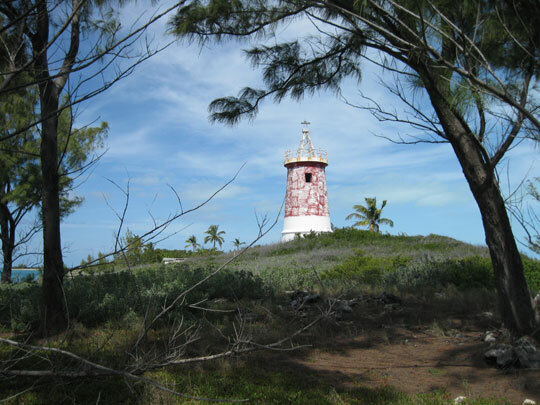 The Gun Cay light house. We would have climbed up in it, but many of the risers were missing and Greg reminded us that we don't have insurance any more. ← We Made it to The Bahamas! This is thrilling stuff. I can’t wait to come. Looks great…sounds like you are really getting your sea legs….speaking of legs, Greg…how’s the knees doing ? Watch out for sea monsters! How are the Berry Islands? Pictures – Stories!!! !